(Nanowerk News) Bacteria are often associated with their disease-causing capacity or alternatively, with their role as normal residents of the human body, where they perform duties essential to health. Joseph Miceli, a researcher at ASU’s Biodesign Institute, studies specialized microorganisms known as anode respiring bacteria (ARB). Rather than investigating their role in health and disease however, his research explores the ability of these microbes to clean up waste and produce useful energy in the form of electricity or hydrogen. Miceli studies under Rosa Krajmalnik-Brown and Cesar Torres, who head the microbial electrochemical cell team in Biodesign’s Swette Center for Environmental Biotechnology. The center is devoted to putting microbes to work to address societal challenges, including environmental decontamination (particularly water sources) and production of clean energy from waste. Bench-top Microbial Fuel Cell (MFC): Bacteria attach themselves to the anode of a battery and transfer their electrons to the metal. These electrons then flow to the cathode side, generating useable electricity in the process. An alternate form of the device produces hydrogen at the cathode. “One of the ways we currently treat wastewater from such sources as food processing is to use aerobic organisms,” Miceli says, referring to bacteria requiring oxygen for survival. “So we have to pump oxygen into the system in order to help feed the bacteria, which break down the chemical contaminants. This adds a very large cost.” Indeed, previous studies suggest the extra energy that must be supplied to aerobic organisms accounts for around 50 percent of the energy price tag for such wastewater treatment. By contrast, the anode respiring bacteria Miceli focuses on are anaerobic organisms, which thrive in oxygen-free environments. Their successful application for wastewater treatment would therefore drive down the cost substantially, but that is only half the story. Anode respiring bacteria can perform another impressive feat, producing harvestable energy in the course of their respiration activities. Some of Krajmalnik-Brown andTorres’ group’s findings recently appeared in the journal Environmental Science & Technology ("Enrichment and Analysis of Anode-Respiring Bacteria from Diverse Anaerobic Inocula"). At the Swette Center, researchers like Miceli work on various aspects of microbial electrochemical cell (MXC) technology. Here, anode respiring bacteria are able to transfer electrons to the negative terminal or anode of a kind of biological battery. The electrons are then free to flow to the cathode or positive side of the battery, generating useable current in the process. MXC technology, while still at an experimental stage, holds the promise of biodegrading various organic waste streams – from pig manure to food processing waste – while extracting clean energy in the process, a win-win situation. Use of the device in its MEC configuration on the other hand, would perform electrolysis to form hydrogen as its output, rather than electricity. This could help to reduce society’s reliance on natural gas and other fossil fuels currently used for hydrogen manufacture. Miceli stresses the intensely interdisciplinary nature of such research, which combines engineering and device design with microbiology, molecular biology and chemistry. This integrated approach is essential for understanding how microbial ecosystems work, so that they may be applied to improve public health and sustainability. Microbial electrochemical cells are composed of two compartments. In the devices Miceli uses for benchtop study, these usually consist of mason-jar sized chambers, which comprise the two terminals of the battery. Anode respiring bacteria are grown in the negative or anode chamber and permitted to feed on organic substances. Having consumed an organic substrate for food, the bacteria need to give up excess electrons as part of their metabolic pathway. 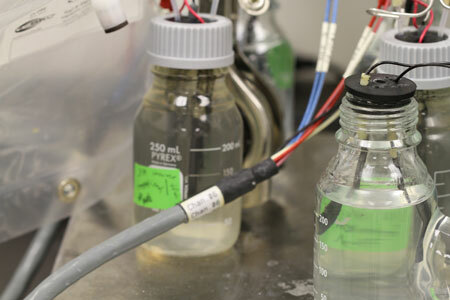 In their naturally occurring state, many such bacteria use iron in the environment for this task, but in the MXC, the electrode in the anode chamber acts as the electron acceptor. The anode respiring bacteria will firmly attach themselves to this electrode, forming a living matrix of protein and sugar. The sticky accumulation is known as a biofilm. Miceli has been particularly interested in the diversity of anode respiring bacteria and how well different bacterial strains perform two essential activities: a) consuming a substrate that may be composed of many different organic ingredients and b) transferring electrons to the anode efficiently in order to produce high current densities. (Current density is simply a measure of electrical current per unit area.) For example, Geobacter, the most commonly studied anode respiring bacteria, is very good at producing high current densities but for the most part only likes one compound – acetate, which is a fatty acid. To obtain a wide range of diverse microorganisms capable of acting as anode respiring bacteria, Miceli asked fellow researchers returning home during a break in the academic term to collect samples from marshes, lake sediments, saline microbial mats, and anaerobic soils. The group took 13 samples from around the world, grew them in the anode chamber of an MXC and set a particular voltage at the electrode with a potentiostat. This device produces an electrochemical force on the working electrode and determines which kinds of reactions can take place. Following several stages of enrichment, the group was able to show high current densities for seven out of the 13 samples tested. Notably, the well-known Geobacter only dominated two of the sample communities while other successful samples contained different anode respiring bacteria – some known, others novel, and evidently thriving under diverse environmental conditions. Future efforts will help characterize the individual bacterial types found in the sample communities and examine their suitability for electricity production, wastewater treatment, bioremediation, and hydrogen production.